Peel apple, remove seeds and dice it. Also dice fish. Finely chop dill. Mix in bowl olive oil and mustard with lemon juice. Dress salad with resulting sauce. Put in the fridge for 20 min. The perfect snack for hungry guests. 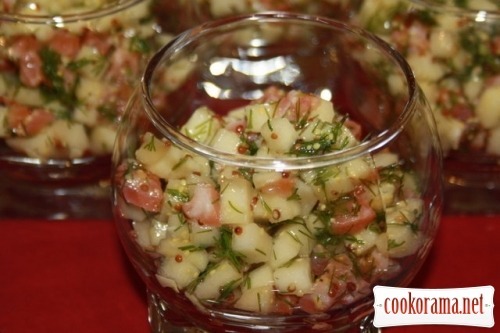 Top of recipe "Norwegian salad"
о! от якраз його я собі на днях і зготую!